We just found an inexpensive bike for our daughter to take with her to college, and now we begin the expensive task of collecting all the things she’ll need to keep it on the road. I’ve been trying to find items for a tool kit that she can carry in her backpack, and of course she’ll need a tire patching kit. I’ve got a standard patching kit for her, but I’ll certainly be looking to add a patchnride tire repair kit to her tool set as soon as they are available. The patchnride is said to be the world’s first permanent tire repair system. 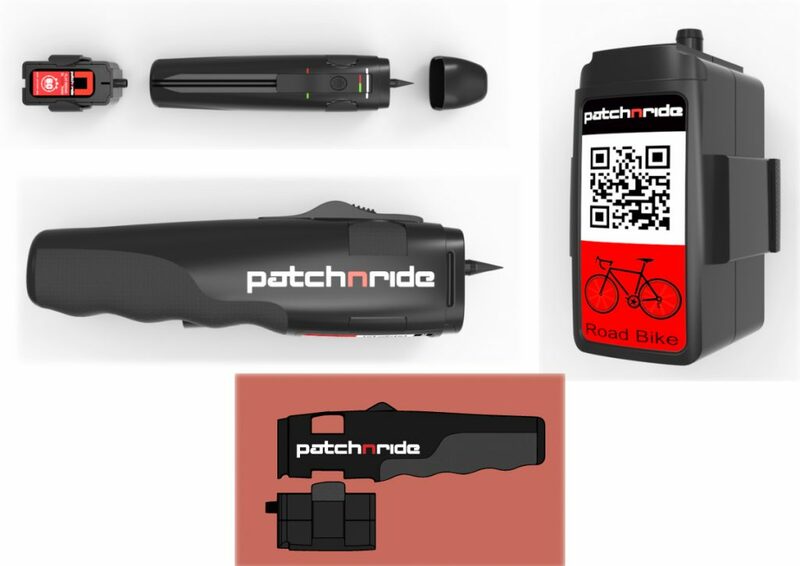 The patchnride actually injects a patch and adhesive into the inner tube and seals up to a 3mm hole from the inside. (According to the FAQs at patchnride, Goodyear Tire Company only considers a tire safe to ride on if it has been patched from the inside.) You just use the included leak detector to find the hole, inject the patch, press the repaired area for a second or two, then re-inflate the tire with your own pump. After it’s used, you’ll need to replace the patch cartridge in the patchnride to be ready for your next repair. Ooo – that looks like exactly what I need! One of the reasons I’ve put off trying to bike commute is fear of getting stuck with a flat. But I’m now in the process of buying a house only 4 (mostly flat) miles from work so have been feeling that I really should try biking it. @Betty They do look great, and I’m hoping they are released very early this fall. I’m not sure how easily Rachel will be able to repair her bike if she has to remove the tires. I can’t wait to get my pre-orders, because I think they’ll be a hit with Rachel and my two nieces who’ll get them at Christmas! Pre-ordered 3 of these. Looks just what I needed to actually use my bike to ride to work! The fear of a puncture and having to take of the wheel etc kept me off it! It does look like a great gadget if it works as advertised. On the other hand, I have been commuting to work on a bike twice a week for the last 15 years. I ride a road bike with skinny (25mm) tires. I got 2 flat tires in those 15 years! So, while a flat tire is an inconvenience, in reality it, I don’t think it is that big of a deal, much less so than the traffic that many people face daily. And if you do get a flat tire, you have a story to tell to your co-workers. Come to think of it, all these years working with many bike commuters, I don’t recall any one’s story about being late due to a flat tire. I always carry with me a spare inner tube, a patch kit, and a pocket pump. It took me 5 minutes to change my flat tire and I don’t do it very often. Sure, if patch-n-ride works well, I will carry it as it is faster and simpler to use. But not having one should not prevent you from riding your bike. Moreover, learning how to change a tube is important as patch-n-ride doesn’t work for all type of flats. But then again, I guess you can call someone with a car.